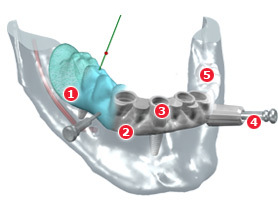 NobelGuide is a highly sophisticated planning and viewing software solution for use with dental CT scans. It also allows for the production of drill guides and, if used in conjunction with the NobelGuide surgical kit, can also produce provisional or even definitive bridgework before surgery has even taken place. To get maximum benefit from this software the patient should be provided with a radiographic stent, which must be entirely radiolucent except for 6-9 radiographic markers scattered throughout. The stent should have extended flanges and be well-fitted and stable. Contact us or your local NobelBiocare rep for more information on the design. If you want to use NobelGuide we will produce a CD with two directories – one with patient DICOM and one with stent DICOM. This will be delivered to you within two working days. Please contact us if you have any questions about NobelGuide.